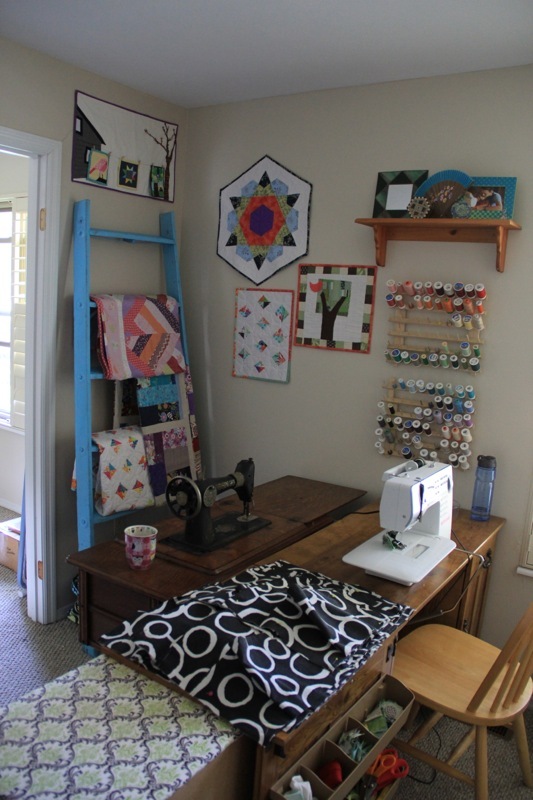 Okay, one month after I said we’d share our cleaned-up sewing space, here we are, ready to show our cleaned up sewing spaces. 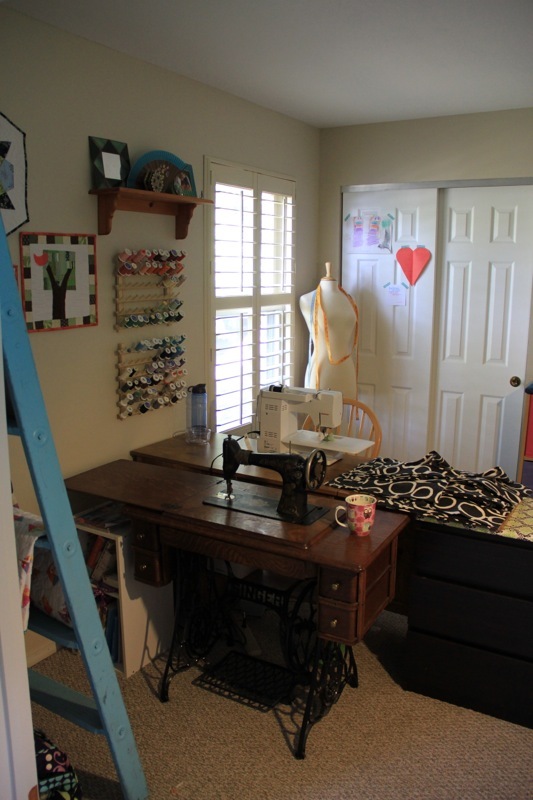 My sewing room is a little 9×10 ft room off our master bedroom. It’s probably intended as an office or nursery, but in our house, it’s a sewing room. My husband said I could have it. I’m sure it’s only because he didn’t want my fabric vomit in the main area of the house. It’s easy to hide up here! Standing in my bedroom looking in, we see the treadle machine that a friend in Virginia gifted me on the eve of our move. I thought I would learn how to use it, but she seems to be missing the piece that connects the treadle to the machine. Wonder where I can acquire that? Also, this Singer needs a name. Any ideas? My Bernina is Victoria, but goes by Tori, and Beatrix, the Janome mini, likes to be called Trixie. Don’t laugh. I know you name your sewing machines. Tori is just behind, so I can sew by the window, even though it’s usually dark outside (sewing by moonlight, remember?). 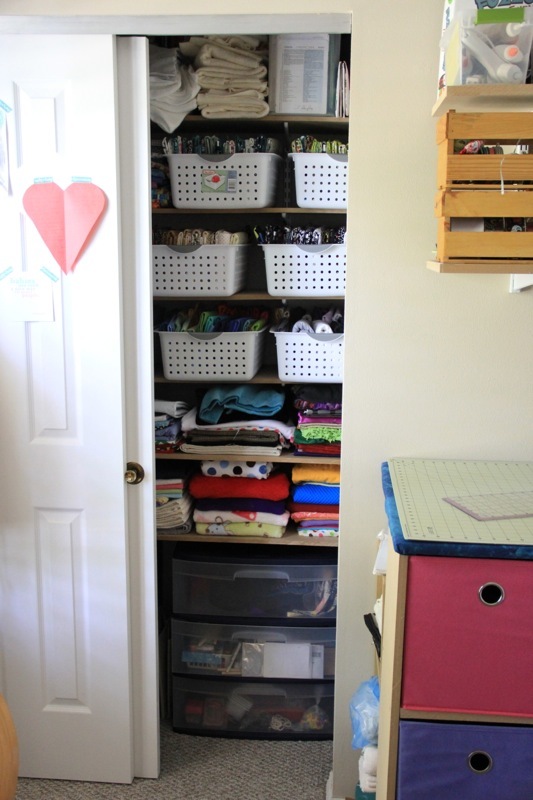 The closet is fabric storage. I’ll show you that in a minute. Moving to the right, there is my custom counter height iron surface/cutting table/scrap storage. I made it myself, and it is far from perfect, but I’m quite pleased with myself because did I mention I built it?! And hey, there’s a design wall. Something I’ve always wanted to have and I was sure to include that in the plan when I set up this room. It’s attached to the wall with masking tape, but that’s not working out. My mom just came to visit, and gave me a new idea, so I hope that will be fixed soon. Okay, now we are standing in the corner by the closet, looking out toward the bedroom. There’s the other side of the design wall, plus shelves with mostly bottomweight and apparel fabrics. The wooden boxes on top do have some charm packs and can you count the four lint rollers? The black and white fabric next to the sewing machine will be those 26 chair pockets I’m making for my daughter’s kindergarten teacher. The final corner of the room is my favorite. Minis on the wall, and that old ladder I found in our garage when we moved in. 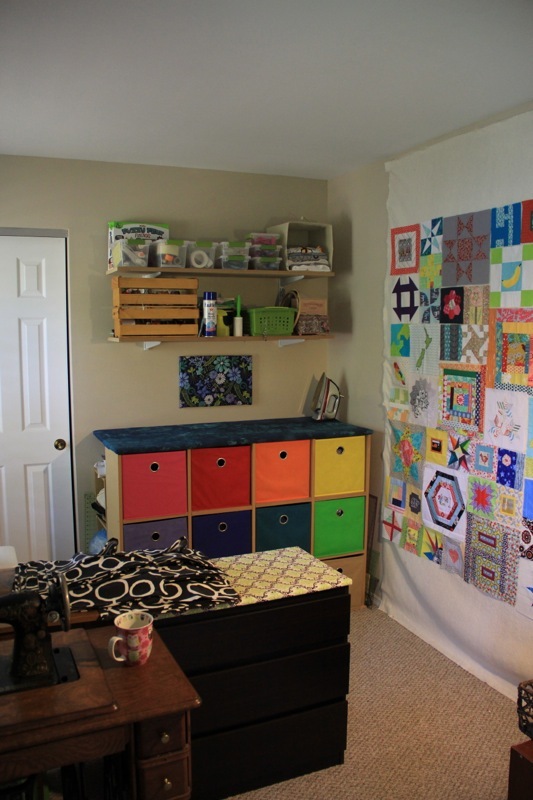 I used some aqua spray paint and now it’s quilt storage. Plus, there’s a shelf of special things and that rainbow thread. Love! Some other tidbits: beside the sewing machine is a basket to toss scraps before I sort them as well as the trash bin. And Sally the dress form holds a couple tape measures. Here’s that cutting/ironing/storage piece. Works great for me since I’m tall-ish, but it would likely be too tall for someone a little more vertically challenged than me. I want to mention the fabric I used to cover the top. It’s twill, hand-dyed by me, using a low water immersion technique. I had intended it for another project, but that was a couple years ago, and I never got to it, so it has been repurposed here. Add a cutting mat (I finally bought myself a big one) and it becomes a cutting table! Here, I’ll even let you see inside the closet. On top there is some batting, and box of patterns. Quilting cottons are in the white baskets. Below that, flannel, minky, silky fabrics, knits, and other miscellaneous fabric. 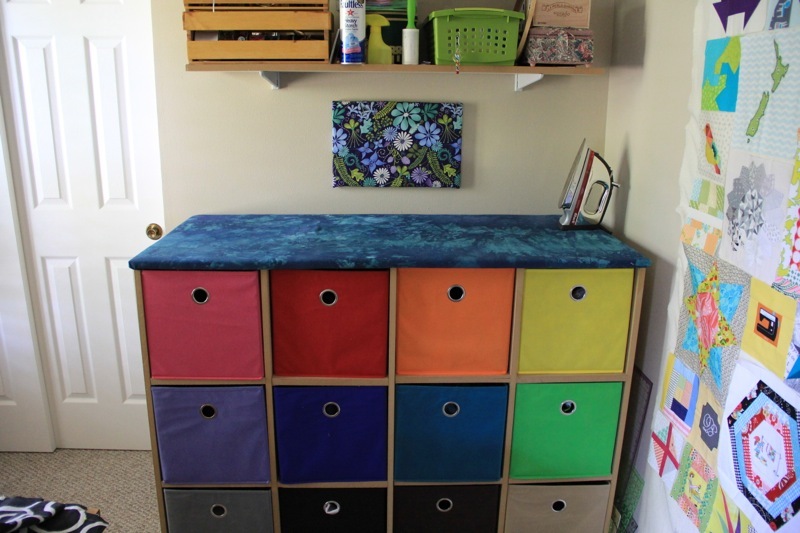 The bottom has two plastic dressers that store other craft supplies (paint, paper crafts, beading). And that’s it. I wonder how long I will be able to keep this space tidy … I put the over/under at 3 weeks. And now: I want to see your space. 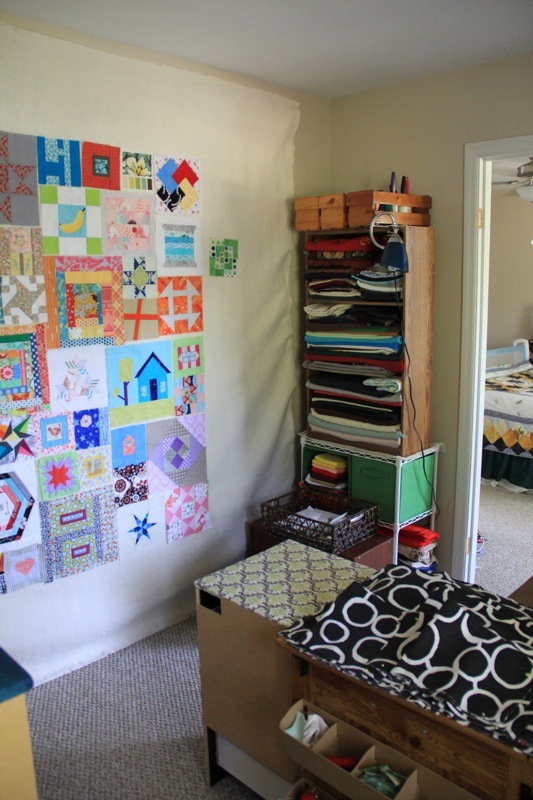 Even if you didn’t link up your mess in the Sewing Room Clean Up Along: BEFORE post, please feel free to show us around. 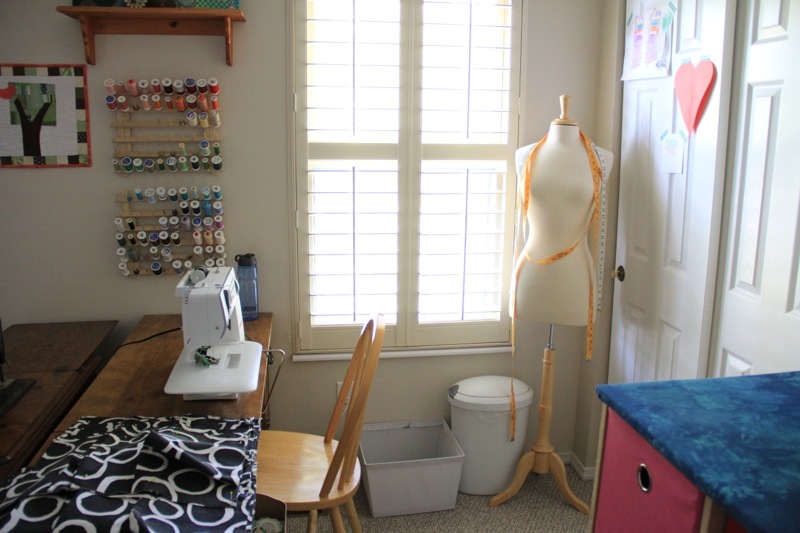 I want to see where you sew and craft! You cleaned it 6 weeks ago when I first mentioned this but I waited too long and it’s a disaster again? No worries, I’ll leave the link up open for 2 weeks. So go, tidy up, then come on back and show me your space! P.S. I set up the link tool to close in two weeks and realized that's my birthday! Love your organizational skills. I’m jealous of your bright and cheery workspace. Fantastic! I’m still in the during phase. Once I set up a work table with my sewing machine and serger on it, I got sidetracked with sewing. I need to get back to the organizing . . . at some point. It looks wonderful! Love your ladder… so perfect for storage and a great splash of color too. It looks like everything has a home – to me that makes it much easier to keep things under control. Enjoy it and thanks for sharing! The treadle belt you’re missing can be purchased at sewclassic.com. Love you sewing space!! Jealous! 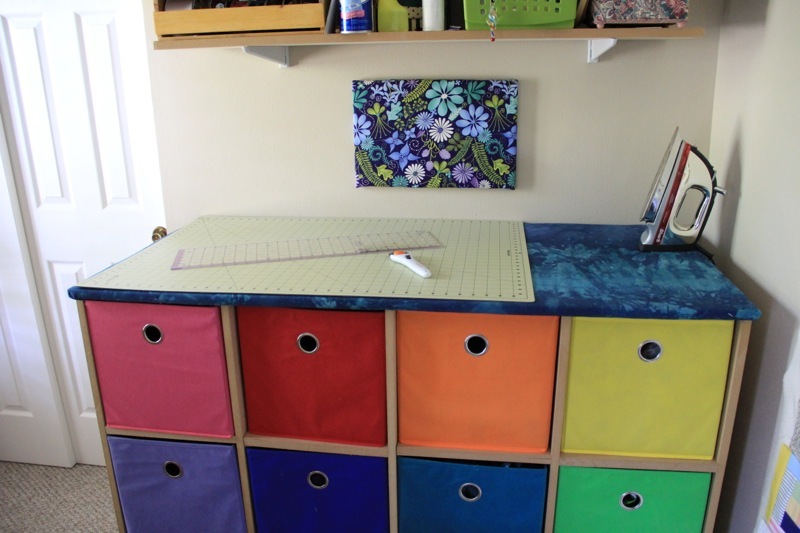 Nice use of space and color in your sewing space. I also have a treadle machine and what you are missing is the treadle belt. It is a leather belt you can purchase on line at Ken’s sewing center for about $15.00. http://www.kenssewingcenter.com/sewing-machine-leather-treadle-belt-p-31155.html? 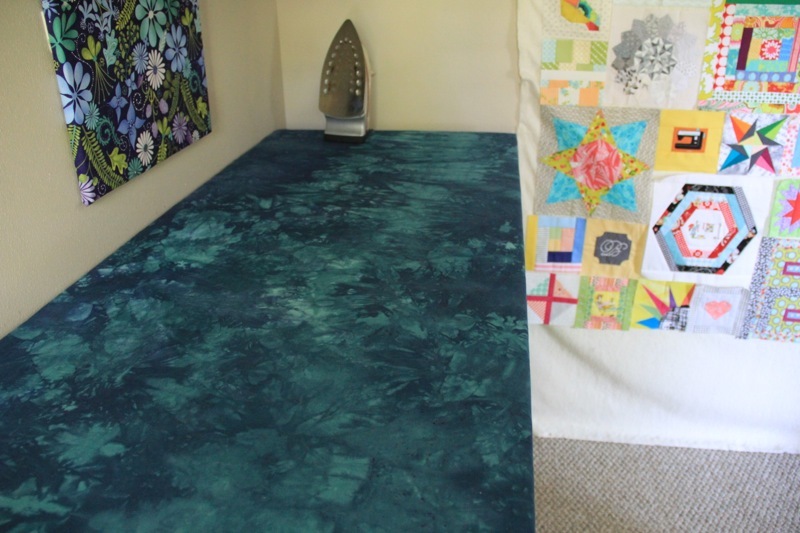 That mini of yours with the quilts on the line is just wonderful! Gives me an idea to work from an old pic I have of clothes on the line. And the ladder – useful and love the color! Plus, what an ingenious way to make your ironing space do double duty with storage. I finally splurged on a new board last month that has a cradle for the iron so I can stop worrying about it falling on a child underfoot, but gosh it’s even more of space waster than the shorter one before!